We need a cornerstone to start a building, Jesus is the cornerstone we need! If we are going to be perfect then we will have to learn hard truths and the truth shall make you free. 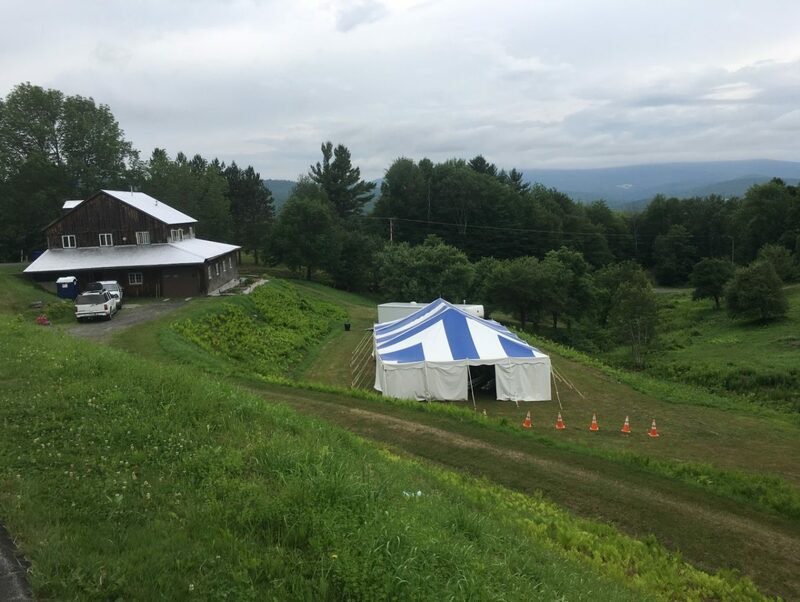 CLICK BELOW TO LISTEN TO AUDIO FROM THE VERMONT TENT REVIVAL FROM July 16th to July 21st, 2018. We need a cornerstone to start a building, and Jesus is the cornerstone we need! Christ expects us to be perfect. There have been people who were perfect. Salvation is by grace, grace covers sin. Noah’s sin was covered. No other man called on the Lord. When we are praying, it is to God Almighty, it is not our job to tell Him what to do. God commands us to know His ways and His ways are perfect. If we can’t get the fundamentals right, we won’t go unto perfection. People don’t speak the Word of God because they don’t walk in it. A saint is someone who believes the Word of God. A saint is a sinner. Peace comes from God our Father and the Lord Jesus Christ. It has nothing to do with peace between man and man. It’s peace between us and God. When we come to the cross of Christ we acknowledge our ways are not His ways, we repent, and align our will with God’s will, God’s will cannot be broken, ours can. Corruption is everywhere in the nation, because Christians lack faith in Christ. We can only minister by the Spirit of God, in accordance with His Word! Who perfects the saints? Who edifies the body? The greatest pride is not in the government but in the churches. There is no Spirit of God in most churches. In God’s army there are apostles, prophets, evangelists, pastors and teachers. He is the God of Hosts. Why were the disciples called disciples? They’re students of Jesus Christ. Jesus walked that middle road of freedom in God. People hated Him from both sides. Everything Jesus ever said was of love, even when it was very hard. God has called us to do greater works than Jesus did. The key is to be in Christ Jesus, that is where we can be one with God and that is what it is to be perfect. That is the promise of God to each of us. The only difference between us and Jesus when He was on the earth as a man, is that He had no sin. The evil in this world is pride and unbelief. When people believe the apostles and prophets word, they are blessed. We don’t have to be smart or have anything to offer to know the Lord, in ourselves we have nothing to offer. God’s grace is far better than being smart. If we don’t walk in His ways, He’s not going to back us up. Most people don’t know His ways, if we walk in them He will back us up. This week is about going on unto perfection. Learning to do things His way! If we’re going to be perfect as He is perfect, we’re going to have to walk it out as He did. If we are going to be perfect then we will have to learn hard truths and the truth shall make you free. Most people think they have loved others most of their lives and they don’t even know what the love of God is. You will love people like they love you, but if they don’t love you like you want them to, then you won’t love them. Jesus commands us to be perfect even as our Father in Heaven is perfect. If you want to walk in the Lord, you will have to humble yourself. If you are one with God, then you will be just like Him but not in your flesh. Ministering God’s love has nothing to do with you. You can’t have God’s love without Him. Jesus could do no good thing by Himself. We are capable of seeking the will of the Father. It’s called prayer. The church cannot go unto perfection because they can’t agree on the fundamental principles of the Word of God. Freedom is that you get to make your own choices. Our nation is not free because it has departed from the Lord. We want what we want and don’t want to change. We come to Christ with nothing and then He can equip us to serve Him. When we sing worship songs to the Lord, do we know His promises? As a believer we are to be seated in heavenly places with Christ Jesus every day of this life to receive every good thing He has for us. We are to be one with God. Are we ashamed to admit we are believers of Jesus Christ? It isn’t common for people to admit they are Christians. Christ commands us to be perfect, without the perfect one (Jesus Christ) we cannot be perfect. God knows we are sinful and alienated by nature, He knows we are not like Him, but wants us to become like Him being perfect. The Lord can and wants to transform us into a person who will work the works of Him to show others He is Lord. Anything we do should be done in love, we are to serve others as unto the Lord. Then people will experience something that most don’t know even exists. The Lord cares about each individual and He wants to inhabit every aspect of our lives. The goal is that we go on to perfection. Most people try to do things to please God, instead of walking by faith. The baptisms are central to us being one with God. What it is to have faith toward God? Jesus is where joy comes from and we walk in it by faith. All the things we receive in Christ, we receive by faith. No other way. It is important to pray continuously to be able to minister unto others rightly. When we pray and seek the Lord and do all things heartily as unto Him, He will give us what we need in every situation. Wisdom comes from God and we can only walk in it if we walk by faith. If we are really going to walk with the Lord, we have to be prepared to face a lot of opposition. Rejoice that Christ came to save sinners, all who choose, get to become one with Him and walk with Him. People that don’t even know who Jesus is, can benefit from our faith in Christ and come to know Him. Righteousness is a free gift from God to those who will believe Him. We are saved by the blood of the Lamb. We don’t have the power to make ourselves righteous, we have to receive it from God. God is going to guide us in His love, if we will put all our faith in Him. God wants us to trust Him and His ability to accomplish His will through us. We die because we’re sinners. The three baptisms, an operation that Christ does so we can become one with Him. What are the three baptisms? Jesus’ body is the temple of the Holy Spirit, not our flesh! Once we are one with God we can do the works of God and be perfect as God is perfect! That is what true Christianity is about! Now all the promises of God are YES and AMEN! We can move on unto perfection because God is perfect, not because we are. Jesus is the lover of our soul, not our body. Being perfect is a commandment of God. There is a new life divine for Christians. It’s not you but HE that makes it that way. The Word of God talks about the doctrine of baptisms, which is plural. The churches disagree among themselves about baptism. The baptism in water is not the baptism of repentance as is commonly taught by the churches. The baptism of blood is the baptism of repentance. God is three and yet one: Father, Son and Holy Spirit. Man is also three and yet one: body, soul and spirit. Anything you do that is not of faith is sin. We blame the world’s problems on the failure of Judeo-Christian morality. It is not that, the grace is being pulled back from this country because of works unto self righteousness. You cannot out-sin the grace of God! Baptism of blood is an operation of the Father. Baptism of water is performed by the Holy Spirit translating your soul into the Body of Christ. Baptism of the Holy Spirit is performed by Jesus. The only difference between a Christian and a non-Christian is Jesus Christ. Stop trying to clean yourself up, the flesh will never change. God is love. The fruit of the spirit is love. The love of God is found only in Christ Jesus. Jesus is someone to celebrate and when we get a handle on what He has done for us, we can’t help but celebrate! We can not out-sin God and His grace. Everyone needs grace to cover their sin. Peace is to have peace between man and God. When we stop fighting against God. Jesus took every sin from every single person, past, present and future. The cross represents that, but it also represents our will and God’s will. When we are in line with God’s will, we are at peace. We cannot serve Christ with our old life. Manure will produce amazing soil for many good things to grow well. That’s what Jesus does with our old life, which was useless dung, when we give our lives to Him, He changes us from useless dung to useful manure. The Lord and His grace is extraordinary! The god of this world is not Jesus Christ. God gets blamed for a lot of things He had nothing to do with. God rules the kingdom which is in His body, the Church. Everybody, before receiving the Lord, walk according to the course of this world. It doesn’t matter what sin we find ourselves in, God’s grace is bigger than our sin, He can and wants to transform us into a people in Him. There is no good testimony of man in the scripture, we need to acknowledge we need a Lord and Savior. Judeo-Christian morals never saved anyone, it is Jesus who saves. Grace covers our sin, it has nothing to do with what we do. God’s riches are grace, mercy, love, power and they are freely available to all, all we have to do is ask. Salvation belongs to our God! He is the only one that gives us salvation! There is no other way! It is only done by God’s work done in us by faith. God commands us to be perfect, we cannot be perfect but by Christ Jesus. The church is going about establishing it’s own righteousness. That’s why people don’t want to be like most Christians, they want the Lord but don’t want what most churches offer, they don’t offer Christ. We cannot judge another man’s walk of faith by his flesh! If we become one with Christ, who is perfect, then we can be perfect. Works can’t save us and they don’t please God! The church is unable to go on unto perfection because it’s too busy fighting about the fundamentals. There are three baptisms, as the Lord is three in one. Most people believe there is only one. We all die because we’re sinners, our flesh is sin. The kingdom of God is not heaven, it is a spiritual realm. Every single work of our flesh is a dead work. It is a work of God when it’s done in faith and love, not to glorify a person. Our flesh only wants to glorify itself. Each baptism is performed by a different part of the Godhead. The name of the Father, the Son and the Holy Ghost is Jesus. There are no natural remedies for demonic spirits. Just because there is a spiritual manifestation doesn’t mean it is of God. God confirms His Word, He does not confirm people. The power of God is there to set people free! If we are Christ’s we should be disciples, students. We should graduate and go out doing the works of God. It’s by the laying on of the hands of the apostles that the Holy Ghost is imparted to others. We cannot go unto perfection without the Apostles. When we come into obedience to God then we can become that perfect man which is the body of Christ. God wants to equip His body to go forth and do the works He called us to do. Christ is the answer for us individually and as a nation. A small group of believers in Christ Jesus can change everything. The Word of God is exciting. Satan knows the Word of God better than anyone. The churches are full of ministers who minster Satan and not Jesus. A common mistake of men is giving their wives everything they want. A woman cannot love a man whom she can control. Is the church the bride of Christ or the body of Christ? Jesus only knows those who are His. The Father’s responsibility is to nurture their children in the Word of God. Children used to serve their parents. Today men are oppressed by their children. We get our image of who God is from our fathers. Men have failed to walk in responsibility. How many husbands are willing to teach their wives how to do things in their house? Today men check in with “the boss” a.k.a. their wife. Because men have neglected their responsibility all this other stuff has entered in, but men don’t realize it’s their fault. When you’re being pressed upon on all sides, you have to call on Him (Jesus) and He will find the way out.